Bullistic Unleashed is an iPhone & iPod Touch game app from Millipede giving you the chance to be a bull in a china shop. Using responsive gesture controls, you catapult your bull through the mall leaving a path of destruction. Visually, the graphics are less impressive than the gesture controls and functionality. The home screen is uninteresting, but most mall maps are pretty boring. The graphics in the mall, as your bull smashes about, are sophomoric and dated. The cynical energy of the Bullistic Unleashed iPhone, iPod Touch, and iPad app is a great opportunity to bring wit and sarcasm to the graphics. 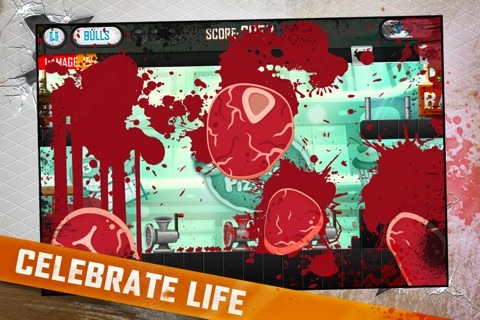 Unfortunately, the splattering guts, broken wine bottles, squatty people, and Mary Poppins-esque awnings don’t complement the vibe of the Bullistic Unleashed iPhone, iPod Touch, and iPad app. The gesture controls and navigation give strength to the the Bullistic Unleashed game app. You catapult your bull with a fling of your finger. Your bull smashes through stores, falls into elevators, bounces off walls and obstacles. It’s essentially pinball in a mall with bulls. When you move through the Bullistic Unleashed iOS game, new functionality is introduced to cause more destruction by adding additional gestures. Before you start each level, there is an excellent overview of the gestures required for you to find success in destruction. You earn points by flinging your bull into a path where it gathers coins and by destroying items. As you unlock levels and earn more points, you can buy enhanced abilities. Or, these special bull powers are available for in-app purchase. With full integration to Game Center, you can monitor your progress creating destruction in the Bullistic Unleashed iPhone, iPod Touch, and iPad app. One of the interesting sharing features is sending an F card via email. An F card is a picture of a bull’s behind. 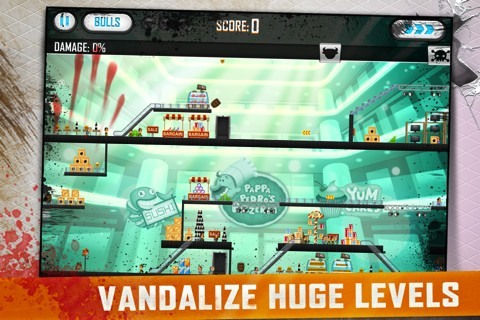 The Bullistic Unleashed iPhone, iPod Touch, and iPad app makes destruction and disaster a bit more fun and interesting. AppSafari review of Bullistic Unleashed was written by Jenni Ward on April 26th, 2012 and categorized under Action, App Store, Arcade, Games. Page viewed 4008 times, 1 so far today. Need help on using these apps? Please read the Help Page.